In this short video, our Peru correspondent Steve LePoidevin provides an inside look at Colca Canyon. He and his wife, Nancy, took part in a two-night trek when they lived in Arequipa. Peru has long been known for the mountaintop citadel of Machu Picchu and the other hundreds of famous archaeological sites scattered throughout the country. But visitors are less familiar with all the other spectacular locations and adventure activities that the country has to offer. Live in Arequipa and you will be close to all the natural splendors of southern Peru. Three volcanic peaks dominate the city skyline: Misti, and the extinct volcanic groups Pichu Pichu and Chachani. Climbing these mountains is a popular weekend pastime for a dedicated group of Arequipa residents as well as adventuresome tourists. The Pacific Coast along with its expansive beaches and small welcoming villages is only a couple of hours away by car or bus. During the summer months of January and February, the city empties as families flock to the seashore for the holidays. 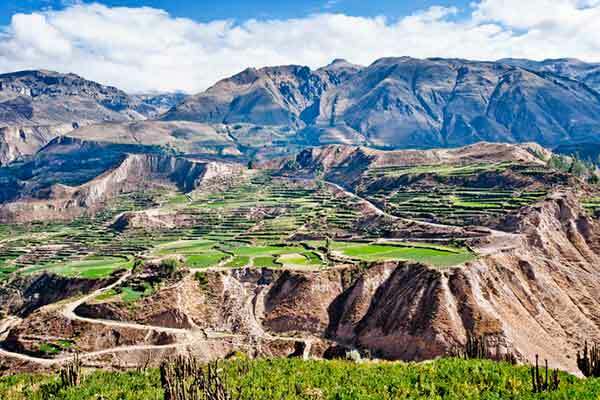 But the crowning glory is Colca Canyon, less than four hours from the city and plunging to a depth of 11,000 feet. This huge outdoor “playground” attracts about 150,000 visitors every year with its miles of hiking trails, indigenous villages, variety of flora and fauna, and rustic hot springs. Colca Canyon offers visitors the opportunity to view a vibrant indigenous culture that has changed little over the centuries. Most activities center around the small towns of Chivay and Cabanaconde. Both act as bases for trekkers heading out to explore the many hiking trails that lead to the canyon floor and beyond. From Arequipa to Chivay, travelers pass through a variety of rugged terrains including desert, altiplano and dry tundra. Along the way they may view herds of llamas and alpacas, soaring eagles, colorful flamingos, and if you are lucky…the mighty Andean Condor. Chivay has a good variety of hotels, hostels and restaurants—as well as La Calera hot springs that are located just outside the town. Both Chivay and Cabanaconde are popular starting points for any treks into the canyon itself. Although it is possible to walk down to the canyon floor and back up in one day, it is much more rewarding to take part in a one or two-night trekking experience. The treks are difficult but doable for most people in average shape. Our Peru correspondent, Steve LePoidevin, said “The trails that lead to and from the bottom of the canyon are steep, rocky, and can be demanding at times. We were not in great shape by any stretch of the imagination and still managed to complete the three-day trek without any problems other than sheer exhaustion by the end of the third day. The final stop in Colca Canyon is often the lush Sangalle Oasis. Here there are a good variety of hostels, restaurants, and refreshing pools to rejuvenate tired muscles and aching bodies before the hike back up to the top…or hanging on for dear life on the back of a burro. It is recommended that visitors book one of the many guided tours available. There is a wide variety of Colca Canyon tours offered by numerous travel agencies located in Arequipa. Two or three-day treks are popular but there are other packages that provide a longer, more in-depth look at the canyon region. Experienced guides can provide detailed information on the flora and fauna of the region as well as a great introduction to the large number of medicinal plants that flourish in this part of Peru. They can also point out the dangerous plants that you will encounter, some of which can cause blindness if the acidic sap from broken twigs gets into your eyes. Trying to save a few dollars by doing it all on your own is not a good idea.